I have picked up knitting…again. I have a mother who can knit anything; she is amazing. It is one of the many things she creates with her hands; she has a love and a passion for making beautiful things and giving them to others. Though I have marveled at her my whole life for her dedication, skill, and joy that comes with her craft and I have certainly started many projects with very good intention, I would not call myself a knitter. I give up. I never finish a project and I lose interest until the next time when my mom inspires me. This has been going on for decades. This time is different, though. I am very close to completing my project for the first time without giving up and without running to my mom to ask her to save me, fix the mistake I made or even just finish the project for me. I haven’t given up this time. Here’s what I have learned. When you start a knitting project, you take the skein of wool and roll it into a ball from which you then start knitting. As you roll the yarn around the ball, making it bigger and bigger, you simply guide the wool with your hand. It passes through very lightly. As the ball gets bigger it becomes easier. If you’re lucky, that’s it and you can begin knitting with this yarn transformed from the skein to the ball. However, it rarely works like that. Often the yarn gets a little tangles and you feel a knot try to glide through your hand. If you are not aware and don’t notice the knot, if you pull too tightly, it becomes very challenging to undo. Noticing the knot right away, you can free it and move on. All of this is true too when the actual knitting with the needles begin. The first row is always the hardest, just like the first steps towards anything is the most challenging. There is no momentum yet, all the energy comes from your internal desire to create. However, as you begin to knit the rows, you weave the yarn and it creates a beautiful masterpiece from a combination of will, love, presence, surrender, co-participation and joy. That’s pretty amazing! Let me explain. The desire is what makes us show up, start the project. In life, this is what makes us live an intentional life. The love is the time and effort put into row after row after row of knitting. In life, this is making the choice of how you want to show up for your life. It’s the perspective you bring to your day to day. Do you want to create a day full of higher vibration and intention? Presence is taking the time to slow down, to move into your body, to focus your attention and to notice what and how you are knitting. Perhaps my favorite reflection on knitting: surrender. Much like creating the ball from the skein, if you hold tightly onto the needles or the yarn, it becomes a chore, a burden, heavy and awkward. However, if you balance the effort of showing up with a softness and letting go of doing all the work, it almost feels as though the yarn is kitting itself. 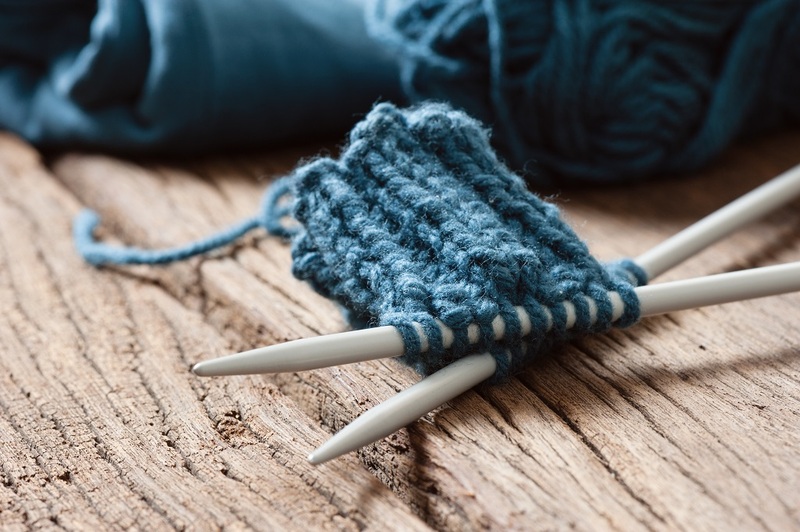 The needles and the yarn work with the hands in perfect balance. In our day to day existence, this is the key to freedom, to weaving our life into a beautiful tapestry of color and beauty and texture. We are at ease, the stitches are balanced and flow in our hands and the needles moving in sync is perfect. The needles can’t do it all and the hands can’t do it all. As we come to see in life that we are not alone, there is a bigger energy working behind us, with us, we find ourself gliding through life with a deep sense of peace and freedom from this co-participation. Sometimes we make mistakes. Sometimes we create a knot. We can get stuck. This is where I have always given up. If we pull too tightly, the knot gets tighter and it’s harder to undo. I have even been known to leave the knot and keep knitting. This changes the whole pattern. However, as we learn to know with more grace, as we hold on with less force, when the knots happen, and they will, they are easier to undo. It becomes easier to move on and the pattern continues. In our lives, if we can be a bit softer, when the obstacles in our lives appear, we can let them appear, notice them, let them go and move on. We do not interrupt the pattern of our lives. This is what knitting has taught me. This is what my mom has taught me. I don’t know if I will finish my project this time. I have a feeling I will because there is less effort and more joy. I am letting go of holding so tightly and receiving the support of the needles. The funny thing is, because of this balance, there are fewer knots. I wonder if that part is true in life as well. I look forward to finding out as I knit my way through life with more desire, love, presence, surrender and joy. May you find happy knitting in your life…with or without needles!